Things I Learned from Michael Jackson: #6 "Holding onto the Inner Child"
When I think about what I have learned from Michael Jackson, I could probably come up with a dozen things...but to narrow it down and describe the most important thing I've learned from him...I think that would be holding onto that inner child within. I think it all began when I first watched the Living With Michael Jackson documentary back in 2003. Before I knew how Martin Bashir twisted and edited the footage, all I saw was Michael, a sweet and sensitive soul. A man who enjoyed having fun and doing things that he was unable to do in his youth. 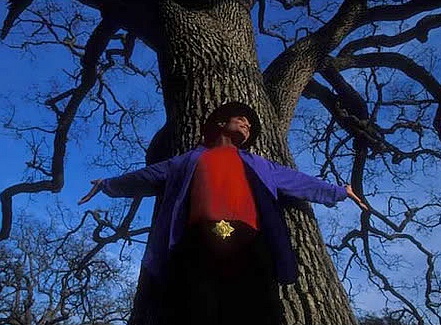 I saw him climb up his Giving Tree and sit there as a free spirit. When I heard him describe himself as being “Peter Pan in his heart,” I completely understood what he meant by that because I too preferred to hold onto my childhood, and not lose that innocence of it. But seeing Michael embracing these qualities actually helped me to accept those qualities within myself. I still enjoy things I enjoyed when I was a kid. I find joy in simple things. I still love watching kids movies and I know I always will. They are actually my favorite kinds of movies to watch because there are often a lot of lessons in them that adults can learn a thing or two from. You are so right Elise, He makes us feel it's OK to be that person who still likes childlike things. In fact, he let us know that it should be our goal in life, if we want to be happy and change the world! Thanks for this reminder. This is so lovely, Elise. Remember that feeling always. Love and Peace, Sue.